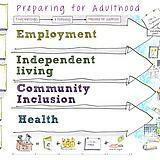 This part of the RIS Local Offer is all about preparing children and young people with SEND for adulthood. Support to develop these skills needs to start as early as possible and be centred around the child or young person’s own ambitions, interests and needs. You can read more about what ‘Preparing for Adulthood’ means and the support you can get from local authorities and health services in section 8 of the SEND Code of Practice.